Golden State celebrate another title. For the third time in four years, the Golden State Warriors sit atop the NBA throne after repeating as champions. There was no need to head back to the Bay Area to close out the NBA Finals this time as Golden State completed a sweep of the Cleveland Cavaliers with a 108-85 win in Game 4 on Friday. The Warriors exerted their dominance from start to finish in a performance that left no reason for doubt. While they’ve often slipped into a lackadaisical malaise during their past two title runs, Game 4 showed their urgency and how much they weren’t willing to mess around. Cleveland were the more desperate team coming into the contest as they fought to stave off a sweep on their home floor, but it was Golden State that looked hungrier at the start and tried to deliver a knockout punch, going up 34-25 by the end of the first quarter. That set the tone for the rest of the way as the Cavaliers were constantly playing off the back foot and trying to stay within arm’s length. 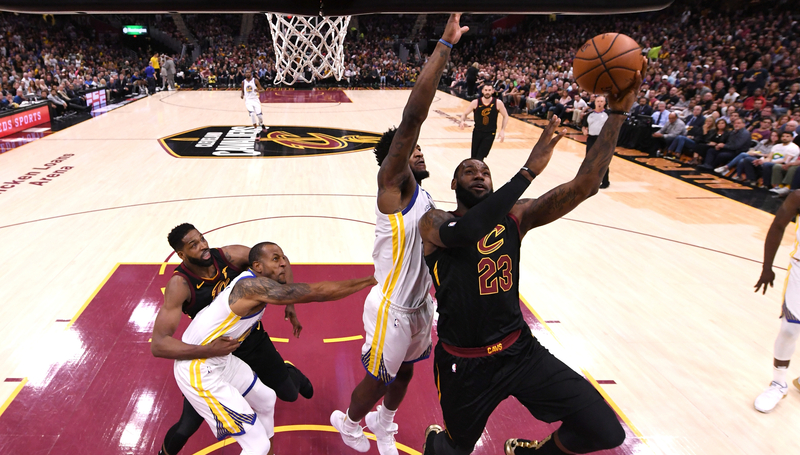 Fittingly, the Warriors used one of their patented third-quarter runs – which buried opposing teams all season – to put the game out of reach as they outscored Cleveland 25-13 coming out of the intermission. But while they hit 14 3-pointers and Stephen Curry had smoldering moments in his 37-point performance, it was Golden State’s defence which was most impressive in the clincher. Not only did they hold the Cavaliers below the century mark for the first time all series, they also limited LeBron James to just 13 shots and 23 points. It may not have been the Warriors’ best game of the series, but they were arguably at their most focused and locked-in to steal the title. Unsurprisingly, the most suspenseful part of Game 4 was the neck-and-neck battle over Finals MVP between Curry and Kevin Durant. It was the latter who ended up with the honour for the second straight year after posting a triple-double with 20 points, 12 rebounds and 10 assists, compared to 37 points, six rebounds and four assists for Curry. For the series, Durant finished with averages of 28.8 points, 10.8 rebounds, 7.5 assists, 2.0 blocks, 52.6 per cent shooting overall and 40.9 per cent on 3s, while Curry averaged 27.5 points, 6.8 assists, 6.0 rebounds, 1.5 steals, 40.2 per cent shooting and 41.5 per cent from deep. From a pure statistical standpoint, there’s no doubt Durant deserved the award, but Curry was arguably better in three of the four games. Game 3, however, was such an iconic performance by Durant – capped by an iconic shot – that it likely carried greater weight. Finals MVP continues to elude Curry as the lone major award missing from his resume, but with how the Warriors are set up for even more sustained success, he’ll have more opportunities to add to his trophy cabinet. And with how unselfish the culture appears to be in Golden State’s locker room, it may not matter all that much to Curry anyways. An unpredictable summer is on the way, but we may have seen LeBron’s final game in a Cavaliers uniform. If that was indeed the final time James walked off the Quicken Loans Arena court as a member of the home team, it was a disappointing end to his tenure in Cleveland. No one could have reasonably expected LeBron and the Cavaliers to win the series against a much more talented team, but avoiding a sweep was a reasonable goal. Instead, the gap between the teams was abundantly clear and that may weigh on James’ mind when he sits back this summer and surveys the landscape before making a decision on his future. LeBron and the Cavs were swept by the Spurs by a total of 24 points in 2007. They lost tonight by 23 and all 4 games by a combined 60 points. Lakers 2002 sweep over Nets was by a combined 37 points. 60 is the most of any of the 9 sweeps. What’s evident in this moment is that Cleveland, as currently constructed, are nowhere near the level of Golden State. And if James’ sole purpose is to compete for championships, staying with the Cavaliers doesn’t look like his best bet to do that. A lot can change, however, and much will in the coming weeks. But as the dust settled after the final minutes of the NBA season, it was hard to ignore the feeling of finality around LeBron. Stephen Curry had 37 points in the clincher. 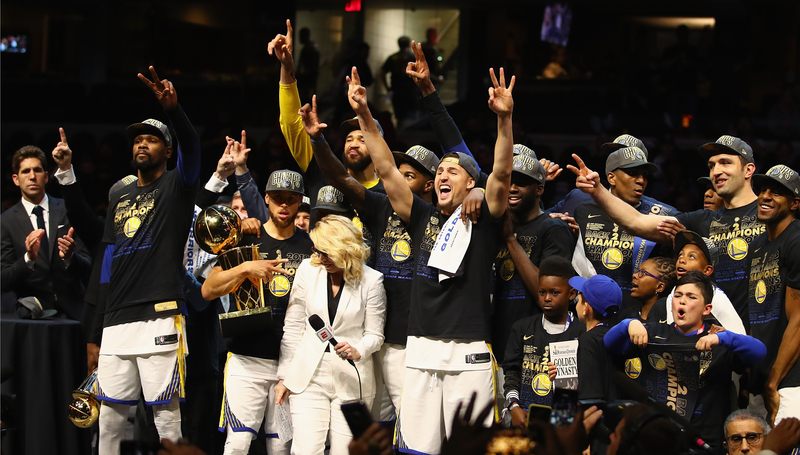 The Golden State Warriors are back-to-back champions as they claimed their third title in four years with a sweep of the Cleveland Cavaliers. 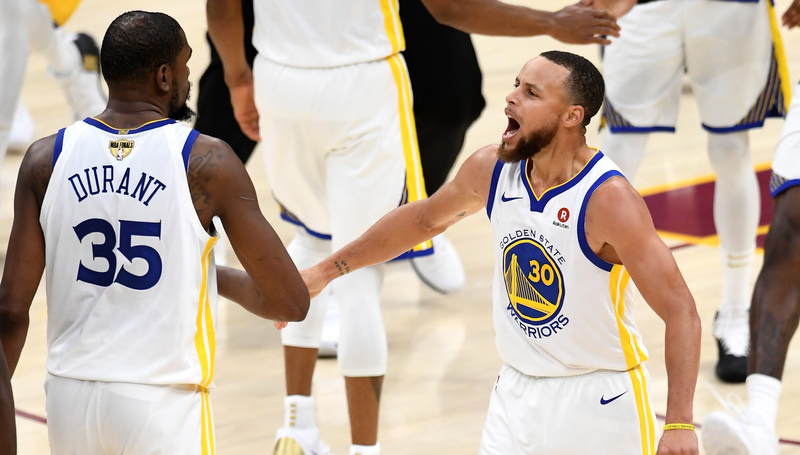 Stephen Curry had 37 points while Finals MVP Kevin Durant recorded a triple-double, but the Warriors’ defence was just as impressive as they locked down LeBron James and Co in 108-85 win in Game 4 of the NBA Finals. Here are our the player grades for both teams. The only suspense left in the NBA season is whether Kevin Durant or Stephen Curry will walk away with Finals MVP. After three games, the two Golden State Warriors stars each have a case for the coveted honour, so it could come down to who performs better in Game 4 (if the Warriors clinch the title with a sweep). Before breaking down the case for each player, let’s get this out of the way first: LeBron James should not win Finals MVP. Has he been the best player in a series in which he’s leading all players in scoring and assists with averages of 37.7 points, 10.7 assists, 6.3 rebounds and 52.5 per cent shooting? Yes. No one’s going to dispute that – or they shouldn’t, at least. But to earn Finals MVP as a player on a losing team, you have to be so head and shoulders beyond the rest of the field that it’s criminal to not get the trophy. There’s a reason only once in NBA history has a losing player been the Finals MVP and that was the first ever edition of the award, given to Los Angeles Lakers icon Jerry West back in 1969. If LeBron was doing what he did in Game 1 – 51 points, eight assists, eight rebounds and 59.4 per cent shooting – every night in this series, then sure, he would probably get the award. But he hasn’t and there are two players on the team that’s actually winning who are deserving. Before Game 3, it seemed like Curry was comfortably on the way to securing his first Finals MVP – an achievement that has eluded him while he’s stocked with trophy cabinet with two championships and two regular season MVPs. Curry’s career probably won’t be looked at any differently whether he has a Finals MVP to his name or not, but from a historical perspective, it would be fitting for a player of his stature and standing among the league’s all-time greats to have at least one on his resume. 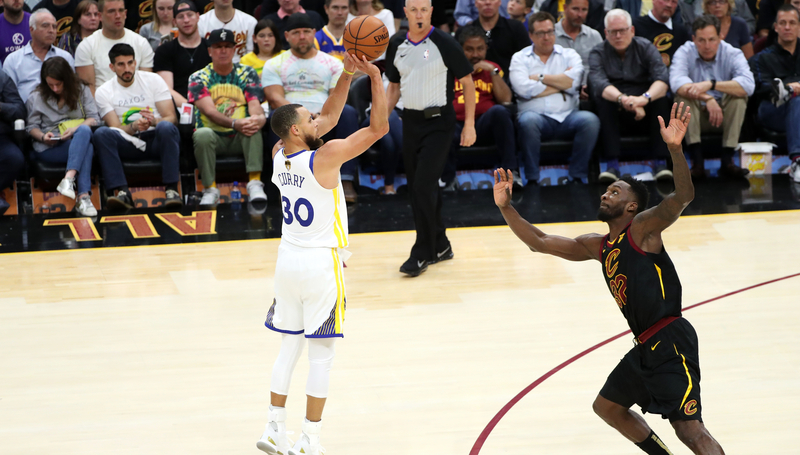 After splashing down a Finals record nine 3-pointers and scoring 33 points in a signature performance in Game 2, Curry looked in line for the award. But the combination of him mightily struggling in Game 3 and Kevin Durant having his own memorable night has likely put Curry behind his teammate. It’s not just that Curry was bad in Game 3, it’s that he had one of the worst shooting nights of his career, hitting just 3-of-16 from the field, including 1-of-10 from deep. Durant, meanwhile, lit it up with 43 points on 15-of-23 shooting, to go with 13 rebounds and seven assists. Like last year, he also hit what may end up being the most memorable shot from the series with his clutch 3-pointer in the final minute. Here are Curry and Durant’s averages up to this point in the Finals. There’s no doubt whose averages look better on paper. Durant is not only putting up more numbers than Curry, he’s doing it more efficiently with ridiculous shooting percentages. He also has recency bias working in his favour, with his best game so far having been after Curry’s. Plus, however you want to account for defence, Durant has the edge in that department as well. It’s fair to say if both players have somewhat similar performances to one another in Game 4 and the Warriors win, Durant will walk away with the hardware. But it’s too late for Curry to jump back into pole position. Obviously if he plays well in the clincher and Durant struggles, the odds shift in his favour. But one thing working to his advantage is his importance to Golden State’s offensive identity, meaning that when he’s clicking, the Warriors attack is at its best. Compare that to Durant, who is more or less a backup option and a high-volume scorer only when the rest of the Warriors aren’t completely in rhythm. Curry is the face and soul of the Warriors, so if he can dominate in such a way in Game 4 that the rest of the team feeds off that – like in Game 2 – then it might not matter what Durant does. This is all based on the idea Golden State finish off this series with a sweep. The longer this goes, the more unpredictable the MVP choice will be.